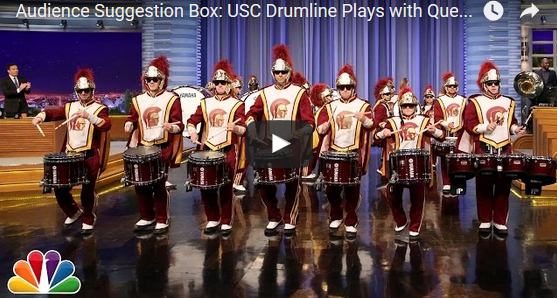 The USC drum line wrote in to Jimmy Fallon to see if they could come on the Tonight Show and play with Quest Love. Well, Jimmy Fallon proved that once again he is the man and surprised the audience by bringing them out for an awesome drum battle. What an awesome opportunity for these students. You may recall that Fallon also had the Villanova piccolo player perform with the Roots last Spring after she went viral for crying during March Madness. Gotta love the support for band students from Jimmy and the Roots. So cool! Share so all fans can enjoy!